Volunteering with Help-Portrait in Baltimore is one of the most amazing experiences I've had! When I first saw the opportunity posted I noticed they were looking for photographers to volunteer. I thought, "Hey, I have a camera and can take a fairly decent picture." Then I saw they required you to have your own portable lights, backdrop, etc. I have none of that and honestly, wondered why so much was required. They also wanted people proficient in photo editing. I don't edit my pictures. Ever. Don't even know how. But, once I saw the results of what this project produced, I was amazed and am glad I didn't try to pass myself off as being capable enough! I worked on the "hospitality" crew which basically means I helped people when they needed it, took lots of "behind the scenes" pictures and sat and talked with the men. I was honored that they were willing to share their stories with me. You can read about Help-Portrait (a world-wide, once-a-year event) and the Helping Up Mission (which is where I volunteered today). I had never heard of the Helping Up Mission (then again, despite living 15 minutes away from Baltimore for the last year I don't really know anything about anything the city offers). Putting my opposition to religious-based...well...anything aside, I was extremely impressed with what they do at this facility. There are between 400-500 men there at any one time participating in a year-long addiction-recovery program which includes counseling, education services, medical services, housing and a lot more and it's free (receiving no public money). This is not a typical homeless shelter and, in fact, not all of the men living there and receiving treatment are homeless. They do, however, offer what they call "overnight guest services" which include a bed, shower and meal for those who simply need a place to stay and don't want to commit to the program. On very cold days those beds will fill in just a few minutes leaving many still with no place to go. The goal of today's project was to give these men (another team in Baltimore did the same thing at the House of Ruth shelter for women and children) a professional portrait. Simple as that. Many of them had family members come to be in the picture with them. It was great to see the family love and support these men are receiving while they're working towards recovery from addiction and return to productive society. It was such a joy to see how proud they were of the work they've done so far and how excited they were with their pictures. Here are a few of the pictures I took (all with permission!). The REAL photographers setting up. This man had a beautiful family and you could see how happy he was to have them there. One of the photographers shows one of the men his picture. Reviewing the pictures and picking the best one (each man got to select one picture to be printed, on the spot). One man and his beautiful mother. One of the men shows me his portrait. Son and grandson there for support. A young man and his mother. The young man wanted to have his official portrait done just of himself so that he could give a copy to his father for Christmas (his mother and father are not together) but he also wanted a picture with his mother. Since only the professional pictures are made available to the men I'm going to print this one and drop it off there for him. This man was stringing some beads that were there for the children. He said he wanted a reminder to keep from this day. When I showed him the picture he told me how his hands used to be swollen so badly they looked like grapefruits. He was amazed at how good they look now. I talked to him (the same man as the photo of the hands) for quite a while. He has a lot of ambition and he seems to be doing very well. This photo was posted by Help-Portrait Baltimore on their FB page yesterday. You heard a lot of similar stories. "This feels good. Last photo I recall was a mug shot for DUI in 2005. Looking good, feeling good, smiling good came of my recovery. It's a whole lot of people lovin me!" Very nice day of service! What a wonderful thing to do for them! I'm sure being a part of the process was an amazing experience. I love learning about unique volunteering opportunities like this and will have to keep this organization in mind the next time I'm in Baltimore. Such a great cause and such great photos! And it's amazing that 23 years is the average length of addiction. 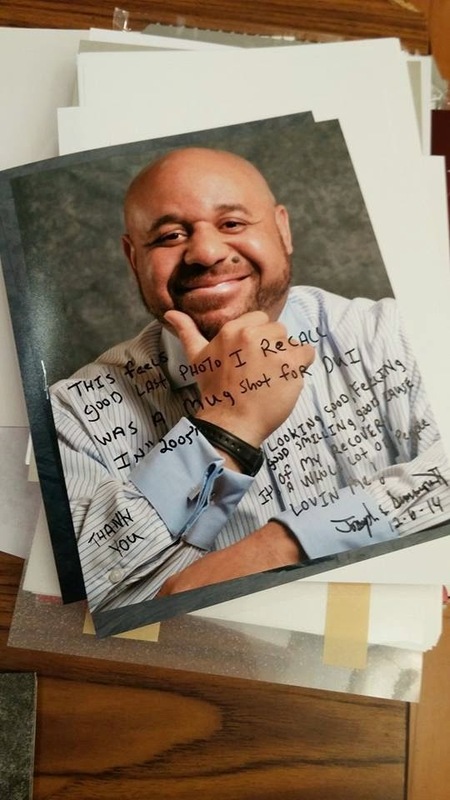 These images are a great testament to how far these men have come in their recovery. Thanks for sharing! Help Portrait is actually world-wide, Dana. But it's only once a year. I'm sure there's one near you. Wow. What a beautiful organization and post to capture it all.